The New Beetle: Avoiding the cuts. MEXICO CITY (Reuters) – Volkswagen AG, among the automakers that have suffered the least in the United States this year, will temporarily shut parts of its Mexican plant starting this week until early August, a union spokesman said on Saturday. The partial closure, starting Wednesday, will be the latest in a series of temporary shutdowns at the factory in recent months as the global slowdown hurts demand for new cars. Union spokesman Arturo Monter said that by idling some operations at the Puebla plant, VW hoped to save jobs while also using the drop in orders to make adjustments to assembly lines. He said about one-third of union workers on assembly lines for the Bora (Jetta) and variant models would be off work for 14 days. For 10 of those days, their pay would be cut by 50 percent. 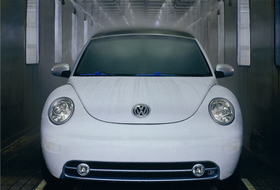 Exports of the popular New Beetle should not be affected. The Puebla plant is VWs only factory in North America, and most of the cars it produces are shipped to the United States, Canada and Europe. Production through mid-June was down 27 percent this year, about half the industry decline for all of North America. VWs U.S. sales have fallen 15.5 percent this year through May in a market thats tumbled 36.5 percent. Only Hyundai, Kia and Subaru have done better. About 70 percent of cars produced across Mexico are destined for the U.S., which is suffering its worst downturn in almost 30 years. VW's new U.S. factory in Chattanooga, Tennessee, is under construction. Mexico is the world's No. 10 producer of autos, but output fell 39.4 percent in May from a year earlier, hit by slumping U.S. demand. The country's plants assembled 108,162 automobiles in May and exported 83,910, industry group AMIA said.